By far my favorite cookie recipe EVER. This is my only cookie recipe from now on. My husband said they’re the best I’ve ever made for him, and my parents ate the whole batch I made for them when they visited. Spot on! Thanks! The cookie was more of a cake consistency. I replaced the and doubled the butter and honey (liquid and powdered honey) but overall very good. Thanks for the great recipe. Added vanilla powder to complement the vanilla extract and make sure that there was enough flavor in the dough. Mixed two types of flour: 1 cup almond flower + 1 cup of “cup 4 cup” gluten free flour. Only did this because I ran out of almond flour. Sounds good! I just recently bought vanilla powder for the first time. Interesting product! I need to try it in these cookies stat. Thanks John! I accidentally used the wrong measuring cup and put only one cup of almond flour instead of two, yet somehow they still came out amazing!! 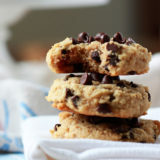 They are so light and fluffy and the chocolate chips are such a nice bite, I might even add some walnuts next time! OMG !!!! THEY WERE SOOOOOOOOOOOOOO GOOOD!!!! I COULDNT BELIEVE IT!! Woow they are as good as regular cookies. Do you think it’s possible to replace the coconut oil with olive oil? We have a coconut allergy in the house. Hmm, I’m not sure that would work. I love olive oil in baked goods but it does add a grassy taste that I’m not sure would be very good in chocolate chip cookies. Plus, the texture would be off. Perhaps canola oil? Just tried these with canola oil and they turned out beautifully! Great recipe! Oh awesome; nice to know! Thanks Lee! it can work if i sub the almond flour in coconut flour? Unfortunately coconut flour is a whole different beast because it soaks up so much liquid, so I wouldn’t attempt it. I should have read comments before attempting – this is clearly the issue I had. I had to throw it out – didn’t come together at all with the coconut flour even though i doubled the wet. I attempted this recipe yesterday. I am not sure what was missing but I followed it and ended up doubling just the wet ingredients and still it was sand like. I tried to press into a sheet pan to see if I could salvage as a bar cookie. It still wouldn’t hold up – broke easily – tasted it and was so very dry I needed a drink immediately. Now my only change was I used Coconut Flour instead of Almond Flour. I was told it was a lighter/fluffier flour – so perhaps I should have reduced it. However in doubling the wet ingredients I expected that would work. It looked great so if you have any suggestions or tips I appreciate it. I made these for my family and they were surprised at how delicious they were! Thanks for the recipe! These were so good! I subbed 1 cup oat flour 1 cup almond flour (instead of 2 cups almond flour) and baked on 300 for 6 minuets, came out perfect :). Can I substitute swerve and liquid stevia for the maple syrup? Not sure how that would change the consistency. These are so good. I am a baker, confectioner by trade. Personally I am on a gf, dairy free, sugar free diet. Best gf cookies yet and I love that they have no refined flour. So good. Question. Have you ever used the almond meal left from making almond milk in these? What can you substitute the maple syrup for ? Is honey ok or regular syrup? I haven’t tried either. Sorry! If you so, please report back! I’ve made these so many times. I’m literally addicted! The link to this recipe in marked in my favorites and I make these weekly! What can you substitute for eggs! 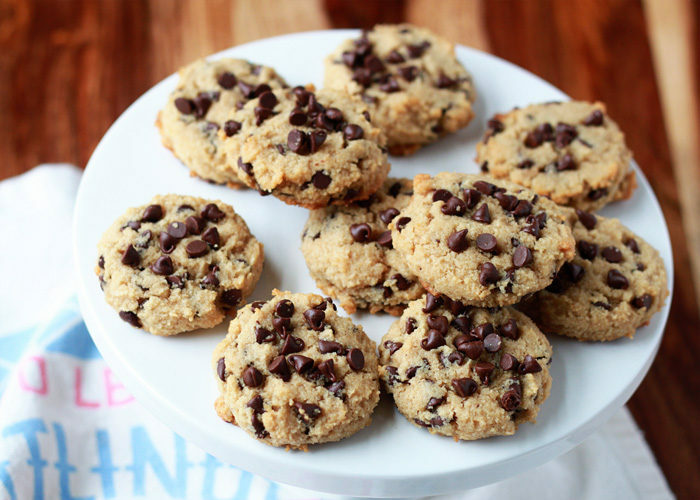 I made these cookies with a flax egg and they came out amazing! This is a great recipe. Can I leave out the egg or sub with something else? I am a vegetarian but wasn’t too make the cookies eggless. Please advice.. I have a friend who tried a flax egg and they turned out pretty well – a bit drier though. And someone just reported that applesauce worked as a great substitute too. How long should I bake as bars? Hmm, I’m not sure this one will work as bars. If you give it a try please report back! Oh I love those additions – yum! We have an egg intolerance in the fam, so I replaced the egg with 1/4 cup unsweetened applesauce – they were still AMAZING! Thank you for the recipe, it’s a new staple in our house. Oh, good to know! I’ll have to try that sub. Thanks Nikki! How do you adjust the recipe when using almond meal? I would like to have a recipe to use the meal leftover from making almond milk. Unfortunately meal leftover from almond milk won’t work the same as almond flour or store-bought almond meal. Which is a bummer because it would be so nice to find a use for leftover almond milk meal! These were terrible. Tasteless hockey pucks. I cannot figure out why there are so many 5 star reviews are on here. I followed the recipe to a T. They’re dry and gross. What a waste of almond flour. Definitely not my experience! What kind of almond flour did you use? Should that be fine tho? I’m not sure, I’ve never tried it! If you do please report back as to how it turned out! 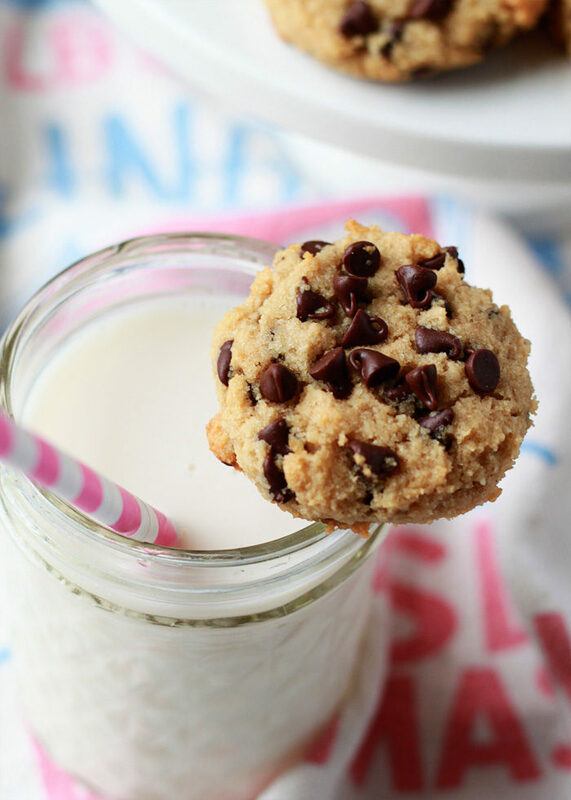 The best “healthy” chocolate chip cookie recipe I’ve tried! I’ve made these several times and my whole family loves them! Thank you for the excellent recipe! These cookies are so delicious! 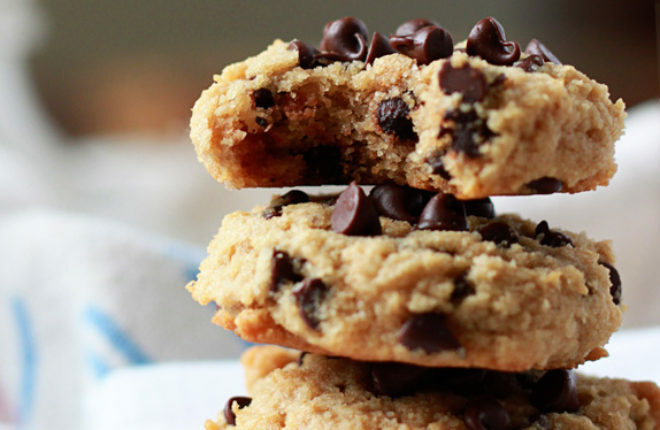 How many Grams of fiber are in each cookie? When I calculated nutrition the fiber amount was 0. Bummer! can I use peanut butter or almond butter instead of coconut oil? I haven’t tried them this way but it’s an interesting idea! If you try it please report back! Have you ever made this with coconut flour? Just realized that I don’t have enough almond flour but plenty of donut? Of course this is after I’ve already mixed the wet ingredients!!! Hi Lori, I haven’t, as coconut flour is its own beast and requires a lot more moisture than almond flour. Sorry! Has anyone tried to make these into bar cookies? Found this recipe in the nick of time! My daughter has many sensitivities and making baked goods is impossible. I used this recipe with one small adjustment…. instead of 1 Large Egg, I substituted with 1/2 apple made into apple sauce (1/2 apple blended with 1/2C water). The cookies turned out perfect!! Soft with a little crunch around the edges and tastes delicious. Thank you for sharing this recipe!! Made these for the first time for a gluten-free friend. Thought they were very good but I think they could have been just a bit sweeter and chocolatier so I probably would up the maple syrup and chocolate chips next time. Instead of coconut oil, I did use the extra light olive oil I use for my biscotti. Since I love nuts in my cookies, I pressed a pecan half into each cookie before baking which looked very nice. My friend liked the recipe as is which is the most important thing. Thank you–great to have a gluten free cookie recipe that is easy and tasty. Can you put some of this dough in the fridge if you aren’t making a full batch that day? Sometimes we just make two cookies and then the other few a day or two later when we want them. Hmmm … I haven’t tried that so I’m not sure! 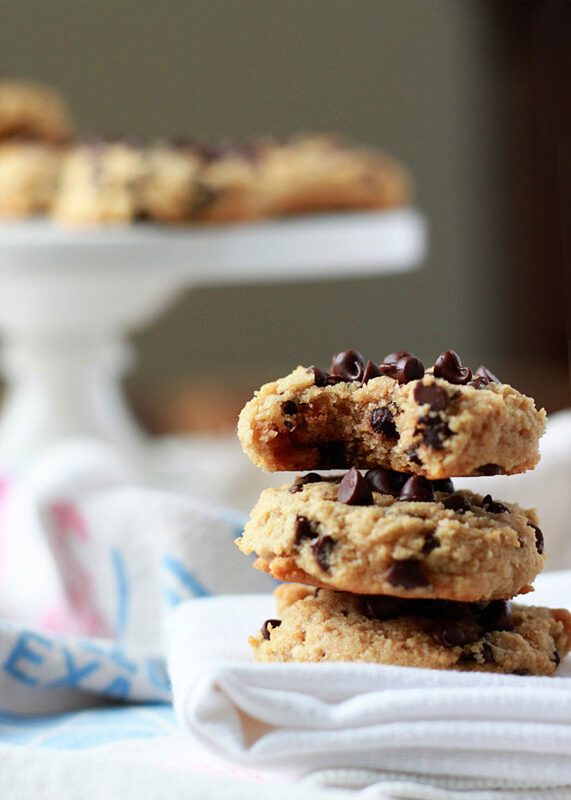 Love the idea for fresh-baked cookies every time. If you try it please report back! I love Coconut flour. So, I decided to use only a half cup. Going against the recipe instructions. It was an epic crumbly mess FAIL. I went through past comments and found someone asked if Coconut Flour can be used/substituted. The answer was ”No. It absorbs to much of the liquid”. I can attest to this! Do Not Use Coconut Flour. I made a second batch following the instructions with the exception of just adding a bit more maple syrup and holy parsnips! these are the BEST cookies EVER! Literally melt in your mouth! Addicting and delicious. My husband gobbled them up! Is there a substitute for the pure maple syrup, to make it lower in carbs? I used half almond flour and half oat flour; I also did half my batch with dried cranberries and raisins instead of chocolate chips for my toddler. Both turned out delicious! Beautiful recipe! So fluffy, crisp on the edge, and at 10,000 ft they only needed about 7 minutes in the oven. (Which was too small for my cookie sheets, so like myself, they got baked a tad tilted in the oven) modified it as below! I added 2 tablespoons of flax seed meal for a nutty flavor and make them healthier! Amazing!!! These were decent! I substituted swerve for the maple syrup and Lilly’s chocolate chips. I’d like to experiment more but they were good. These are my new favorite cookies! I can’t believe how delicious and addicting they are, while also being the healthiest cookies I’ve baked. I’ve made them twice already this week. Love how easy they come together too. Today I did 1/2 tsp vanilla and 1/2 tsp almond extract and I really like how that enhanced the almond flavor. Thanks for my new go-to recipe when I feel like home made cookies!! Woo hoo! I need to try that. My friend made these for a treat at a get together and they were amazing! I do have a question though.. My husband is allergic to raw almonds (all raw nuts) but we didn’t even think about that when eating them and after a few he started to notice his throat itching. So do you think they would turn out as wonderful if I ground my own almond flour from Dry Roasted Almonds? Hi Terry! Oh wow, interesting question. I hope he is feeling okay now! Gosh … I’m not really sure how it would work. Have you found that dry-roasted almond flour works well as a one-for-one substitute in other almond flour recipes? My hunch is that the result might be a bit drier. Perhaps compensate with a bit more coconut oil? If you give it a try please report back! Hey, Terry, I noticed your comment about your husband’s reaction to raw nuts. I have the same thing. It turned out to be something called Oral Allergy Syndrome and some people also have cross reactions to certain kinds of raw fruits. Seems like cooked is fine. Hope he is feeling better! It does make a very thick batter, but it’s definitely not impossible! You did use almond flour? I’ve never baked a gluten free recipe before and definitely lucked out with this one. Very easy recipe that I tweaked a little by adding a little dessicated coconut and grated orange rind – absolutely delicious. Will be making this again and not just for the delight of non-gluten folk. I made this and the cookie dough would not stick together. I called my mom and she said to slowly add water to it. That worked. I did not think the cookies for sweet enough for me. Will be our go to now! Thanks Kare! Omg! Delicious cookies and easy ingredients just the way I like it.